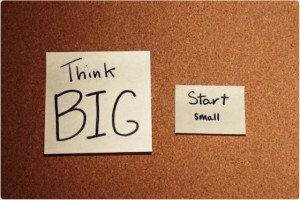 We all have a big dream…a major goal or idea that we would like to accomplish in our lives. Maybe it is starting your own business, getting out of debt, writing a novel or running a marathon. I believe strongly in the idea of pursuing your dreams in life, but that road to accomplishing big dreams is a long one and it’s not smoothly paved. It’s important to have a bigger picture in the back of your mind when progressing toward a big goal, but if you focus solely on that bigger picture, there is an inevitable point where frustration will arise and your mind will tell you it’s too hard, not worth it and to give up. This is where the importance of consistency and focusing on smaller tasks is essential. If you put the energy into the smaller things, you will reap the big rewards. Take the example of working out, you’ve probably seen those 30 or 60 day workout challenges online before…notice how they start off small? It is broken down into daily goals that help you build up your strength gradually. If your big goal is to be strong enough to be able to do 300 push ups in a day, you don’t accomplish it by doing 300 push ups every single day. You start small; Day 1 with 20, Day 2 with 30, on and on until finally one day you’re strong enough to do those 300 push ups. If you just did as many push ups as you could each day and then judged yourself based on how close you were to doing 300, how motivated would you be to keep working hard if after the first couple weeks all you could do was 30 or 40 push ups a day? You’d probably become frustrated realizing just how long it would take until you could do 300 a day. By focusing only on your big goal, you’re more prone to give up. When you think smaller you’re able to put all your energy and focus on the small specific tasks that you have to do that day alone. Mentally it’s not too demanding to do just a few more push ups than you did the previous day and before you know it, you’re strong enough to do those 300 push ups in a day and you’ve accomplished that bigger goal you set for yourself. I know when I was working extremely hard to accomplish my big dream of shooting my first under par regulation golf round, I would often get frustrated with just how far away that goal seemed at times. That day I finally broke through and accomplished my big goal, it came as a result of me breaking down my round into the smallest parts possible. I knew that if I took care of the small things on each hole (Fairways and Greens), the bigger picture (Score) would take care of itself. So when I stepped up on the tee of a par 4, I was focused only on trying to hit the fairway, nothing else…my score up to that point or any score I needed in the future to shoot under par was furthest from my mind. So when you start off on your journey to accomplishing your biggest goals, have a plan and break them down into monthly, weekly or daily goals. Focus your energy on those smaller tasks, stay dedicated and stay consistent. Set a streak for yourself and see how long you can go completing your smaller goals. You’ll find more motivation and the possibility for ultimate reaching your biggest goals will increase!